He looks like he's mid-50s to me, but the point is correct, list your real age. It never really fools anyone and just makes the liar look foolish. 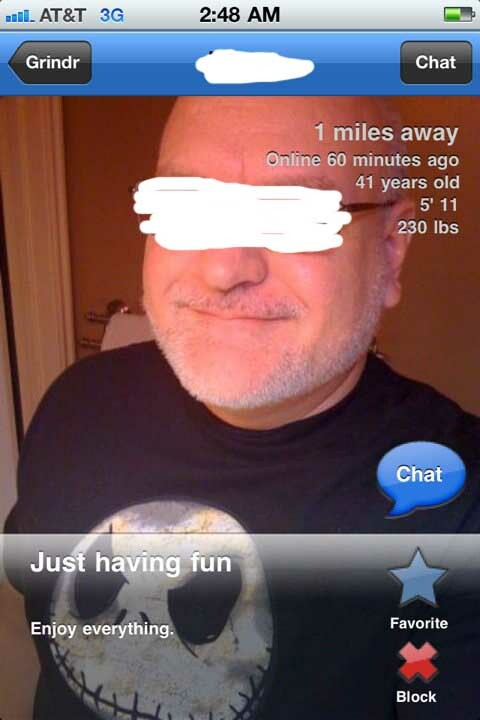 I agree on listing fake ages, and I agree he looks older. But I have seen people my age and younger who I know for a fact really are my age and younger and just happen to look way older, so it's a slippery slope. I don't think lying about your age is as bad as having a fake picture. The fact is, you want this guy or don't want this guy no matter whether he says he's 25, 45 or the world's oldest father at 94. A compromise: Why not write the age you appear to be (at least to others, not your delusional reflection)? He could be 41, but i think not. Actually on Grindr about 50% of the people claim they're 29. Must be something about not exiting your 20s I guess. Personally i was glad to be rid of that decade. My 40s are far superior and damn it i look 10 years younger than i am. I'm 51 but don't look a day over 50. I doubt he is really 41, but as someone who was prematurely gray and who has always looked older than his years (great at 21, not so great at 51), I have to say, what you see is what you get. mattrett got it right. I'd rather this guy use an honest current pic than his favorite one from 15 years ago that is unrecognizable today. And even though Hartley makes a somewhat valid point, he doesn't need to be so smarmy about it. The REAL point here is ... why would you lie younger rather than older? Do you want people to look at your profile and say, "Wow, he looks terrible for 41" or would you prefer "Wow, he looks great for 58"? I just never got the point of lying about age -- it's a sure bet that other insecurities accompany that one. interesting WHICH comments you choose to post. suggestion of leading through example not your thing?